Kohl's is probably my favorite store that I just about never shop at. I may start now. 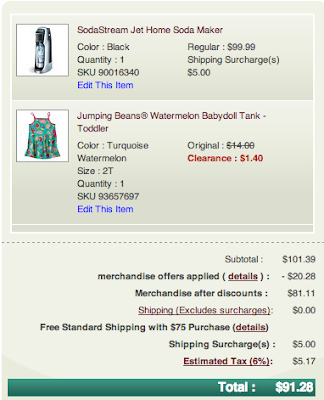 If you have a Chase Freedom, right now is a great time to be shopping at Kohl's online. Here is how to save a lot of money. Kohl's is included in the current 5% rotating categories on Chase Freedom so you get 5 points back for ever dollar you spend in Kohl's up to $1,500 until the end of September. If you already spent the $1,500 at gas stations, like me, you aren't eligible for this 5%. If you start your shopping from Chase's Ultimate Rewards Shopping Portal. You will get an additional 10 points per dollar spent. Either do your shopping this way or buy physical gift cards and you now have 15% off the next time you shop at Kohl's. According to Frequent Miler labs, you can use a Kohl's gift card to pay and you will still get 10 points from Ultimate Rewards Portal. So, buy physical gift cards to get your first 10% through Ultimate Rewards. Then, go back through Ultimate Rewards portal to get another 10% when you pay with your gift card. If you follow these tips, you will get 25 Chase Ultimate Rewards points per dollar that you spend at Kohl's. Use coupon code MARCHING to save 20% off a $100 purchase. There is almost always some sort of coupon code available. Get $10 off Kohl's Cash for every $50 you spend. This is officially expiring today, but they usually have a similar promotion. A Sodastream Soda Maker Starter Kit from Amazon costs $80 with free shipping. From Kohl's the same product costs $100 + a $5 shipping surcharge, which is not a good deal on its own. However, when you add coupon code MARCHING (you have to add another product to get over $100 to qualify for the the 20% discount). The price drops to $86.11 before taxes, which is still more expensive before the Chase Freedom kicks in. You will however get 2,175 Ultimate Rewards points which is a minimum of $21.75 back so you are really only paying $64.25. Then you will get $10 Kohl's cash for spending over $50 which can be used on your next purchase. If you buy the gift cards, it will take a few days to come in the mail and there is no guarantee of a promo code and Kohl's cash at that point, but I think it is still likely. You can still everything else today and get 15 Ultimate rewards points instead of 10 and skip the gift card step. Discover it - 5% Cashback Online! Free Money from Staples - Oren Strikes Again!